Andrea Lamphere is a graduate of Diorr’s Beauty College in Burlington, Vermont. She worked at salons in Burlington for seven years before opening her own shop in 1979. She attended the World Beauty Festival in London, England in 1982. 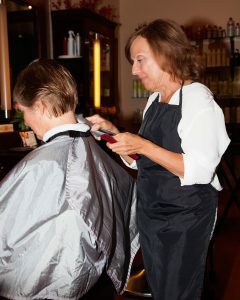 After selling her salon in 1985, Andrea worked for a few salons in Middlebury before joining Texture Salon in 2006. A seasoned hairdresser with over 40 years in the beauty industry, Andrea strives to keep learning new techniques and has studied in Montreal, Boston, New York and London. She tries to attend at least 2 educational events per year and has done so for 42 years, keeping her clients current in today’s fashion.